Steel Warehouse Building Kits | Get a Quick Quote! RHINO steel buildings are the perfect building system for warehouses and distribution centers, regardless of size. Our prefabricated buildings system offers benefits for the warehousing industry which are unavailable with other types of construction. Durable: RHINO steel buildings are built strong to last long, retaining their structural integrity, beauty, and value for many decades. Noncombustible: Lumber is the number one source of first ignited material in warehouse fires; framing lumber is the number two source. Steel framing is noncombustible and cannot be ignited, nor can it add fuel to a fire. Clearspan: RHINO’s rigid frame steel framing is so strong it can span much larger areas without needing cumbersome interior support columns. That allows warehouse operations more flexibility in storing and moving their products quickly and efficiently. RHINO standard steel warehouses can span up to 150’ in width without any interior supports; custom designs can clear span up to 200’ in width or more. Widths up to 480’ are possible with a load-bearing column in the center of the building. RHINO buildings can be any length you need. Building heights up to 40’ are standard, allowing the warehouse owner to exploit vertical dimension for greater SKU (stock keeping unit) capacity. Even higher buildings are available with a custom quote. Warehouse plans can also include mezzanines if desired. 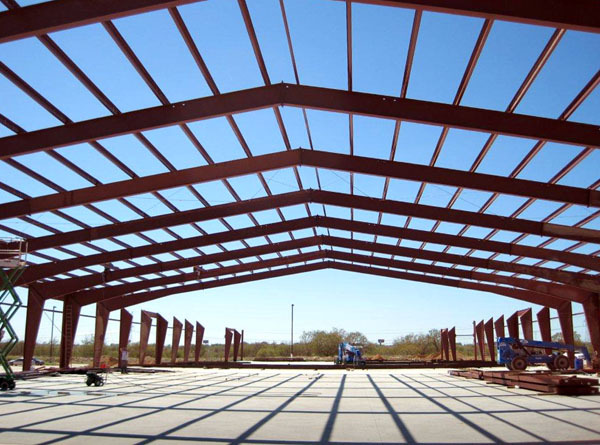 Options: RHINO metal warehouse buildings can be designed with extra loads for sprinkler systems, ceiling cranes, or any other specialized needs. RHINO offers a full range of exterior options, with colorful, durable steel wall and roof panels. Exteriors can also be finished with brick, stone, tilt-up concrete, glass, stucco or any other facade of your choice. See our Metal Building Options page for more details and other options available on our steel warehouse buildings, including skylights and overhead doors. Whether you need a modest 5,000 sq. ft. storage facility or a 500,000 sq. ft. or larger import mega-warehouse, RHINO is the best buy for your material handling operation. Our experienced technical advisors can help you create the ideal warehouse for your business needs. 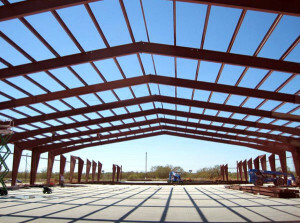 Call RHINO today for a free consultation on a steel warehouse building: 940.383.9566. Share the post "Steel Warehouses"